Tel Aviv: Stating that innovation and entrepreneurship were being encouraged in India, Prime Minister Narendra Modi on Wednesday innovation and technology can boost the relationship between India and Israel. Addressing a 4,000-strong gathering of the Indian diaspora at the Tel Aviv Convention Centre here, Modi said that Israel has progressed so much because of the country's penchant for innovation. He said that India too is a young nation with 65 percent of its population below the age of 35 which which is why, he said, skill development is being given special emphasis. "We have created a separate ministry only for skill development," Modi said. "Around 600 skill development centres are being set up across the country and an Indian Institute of Skills is being established," he stated.While job creators are being given tax relief, he said that innovators and entrepreneurs are being encouraged. He said that Israel was known for innovation and the country today boasts of 12 Nobel laureates. Whether it is solar panels or agribiotechnology, he said Israel has left the rest of the world far behind. "Israel has progressed so much today because of its penchant for innovation," Modi said. "India and Israel can walk together shoulder to shoulder in the field of technology," he stated. He said that the around 600 Indian students undergoing higher studies in Israel were like a bridge between the two countries in innovation and technology. He also spoke about the flagship initiatives of his government, saying that the Make in India campaign has taken everyone by surprise. "India is today becoming the hub of the digital world," he said. "We are making consistent efforts to double farmers' income by 2022 and policies are being being formulated for this," he said. Talking about the reforms undertaken by his government, he said that 100 per cent is now allowed in the construction so that there is housing for all by 2022, the 75th anniversary of India's Independence. In defence sector too, he said that though there were talks of reforms for long, nothing palpable was seen, but his government introduced reforms in the last three years and now 100 percent foreign direct investment is allowed in this sector. 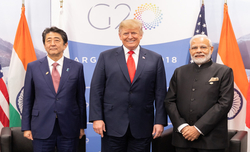 Modi said that bankruptcy and insolvency laws have introduced to give confidence to foreign investors. Modi, who has become the first ever Indian Prime Minister to visit Israel, lamented the fact that it took 70 years after Israel's creation for such a visit to take place. There are around 85,000 Jews of Indian origin in Israel, the majority of them hailing from Maharashtra and known as Bene Israelis. Modi praised the contribution of Jewish Indians for their role in the development of Israel and also recalled the contributions of Jews in India. Of around 10,000 Indian nationals in Israel, around 9,000 work as care-givers while the rest are mostly diamond traders, IT professionals and students. The Prime Minister appreciated the work of the care-givers. Modi also that from now on Overseas Citizen of India (OCI) cards will now be issued to those Jewish Indians who had undergone compulsory military training in Israel. He also announced that flight services between New Delhi, Mumbai and Tel Aviv would be launched soon.Earlier, Israeli Prime Minister Benjamin Netanyahu greeted the crowd and told Modi: "These are Jews of India. They love India, they love Israel." Tel Aviv: Israel Prime Minister Benjamin Netanyahu on Wednesday asked his Indian counterpart Narendra Modi about the investigation of the 2012 attack on the Israeli Embassy in New Delhi. According to officials in the Prime Minister's Bureau, Netanyahu asked whether any progress was made in the probe, Israeli daily Haaretz reported. A joint statement released at the end of the meetings also referred to the issue, the newspaper added. "The two prime ministers emphasised that there can't be any justification whatsoever to terrorist acts," the statement said. "The leaders stressed that harsh measures must be taken against terrorists, terror organisations and whoever supports, encourages, finances or shelters them." According to the statement, Netanyahu and Modi agreed that action must be taken to prevent terror groups from obtaining weapons of mass destruction. India and Israel decided to scale up their relationship to that of a strategic partnership in the fight against terror, with Modi saying the two countries have "agreed to do much more to protect our strategic interests" and to combat rising radicalization and terrorism including in the cyber-space. On the second day of the first visit by an Indian Prime Minister, Modi sought to balance New Delhi's traditional ties with Israel's neighbours by saying India hoped that "peace, dialogue and restraint" will prevail in West Asia. A joint statement issued after the talks said "...strong measures should be taken against terrorists and terror organisations and all those who encourage, support and finance or provide sanctuary to terrorists and terror groups". Tel Aviv: Calling Israel as the land of martyrs, Prime Minister Narendra Modi on Wednesday said that when it comes to courage, size and number does not count. 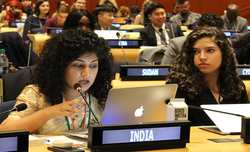 The Prime Minster was addressing the diaspora, including several Indian students and the Jews of Indian origin. "Israel is the land of martyrs. Many families here must have a personal story of sacrifices. They have personal tales of martyrdom. I bow to their valor," Modi said. Praising Israel and its people, Modi added that every nation's development is in the spirit and self determination of its citizen and not in its size. 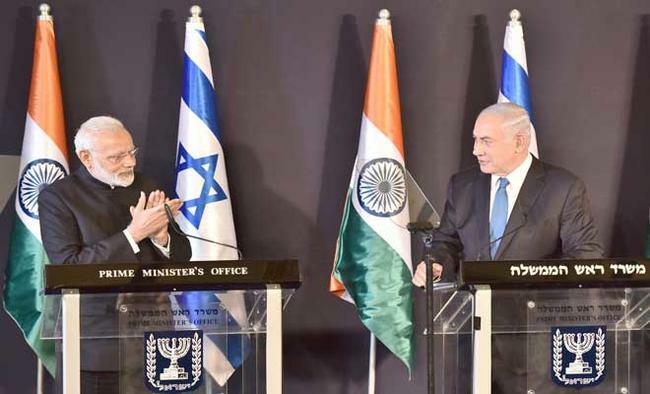 "Numbers and size doesn't matter, Israel has proven that," Modi said. The Indian Prime Minister, who is scheduled to visit the city of Haifa on Thursday to pay homage to the Haifa Indian Cemetery, also pointed out the role of role of Indian soldiers in liberation of Jerusalem and Haifa. The Haifa Indian Cemetery is a homage to Indian war heroes who laid down their lives in world wars during the liberation of Haifa. Indian Army, every here on September 23 marks 'Haifa Day'. "I pay my homage to Second lieutenant Ellis Aston, who was known by the name 'Indian Aston'. He served in Maratha light infantry. Indian soldiers had played a role behind the independence of Haifa. I'm going there to pay homage," Modi said. Saying, "Jews are great people," Modi also recalled Indian Jew Army officer, Lieutenant General Jacob Farj Rafael, who played a prominent role in 1971 Indo-Pak war. "I went to Benjamin's (Netanyahu) house yesterday and we talked till late night. He gifted me a picture of liberation of Jerusalem by the Indian soldiers," Modi said. He further drew parallels between Indian and Israeli culture, saying, "our cooperation is of tradition, culture and mutual trust and friendship". "In our Puranas there's a similarity, we celebrate Holi and Israel marks Purin. We celebrate Diwali and in Israel Hanukkah is celebrated," he said. The Prime Minister also recalled the spiritual link between India and Israel, and said that it was the Indian Sufi saint Baba Fareedm, who meditated in Jerusalem in twelfth century. He further wished the Indian players, who arrived here to mark the Maccanbiah games. "I was happy to know, that Maccanbiah games are beginning tomorrow and I wish people of Israel for this. And I m happy that India has also sent its team, and Indian players are present here, I wish them best wishes," Modi said. Tel Aviv: Prime Minister Narendra Modi on Wednesday announced to start a new flight service connecting Delhi, Mumbai and Tel Aviv. "Now a Delhi-Mumbai-Tel Aviv air service will be initiated. And so I invite youth of Israel to visit India," Modi announced amid thunderous applause. Modi made the announcement while addressing the Indian Diaspora in Tel Aviv's Convention Center. Air India had earlier announced to start direct flight between Delhi and Tel Aviv. The flight service was to start in May but the launch was delayed as several countries, which fall in the selected route, denied the overflight permission. Air India used to operate directs flights to Israel from Delhi until mid-1990s and Mumbai until early 2000. The flights were withdrawn for commercial reasons.